One doesn’t notice how strange one’s house smells until one walks outside and then comes back in a few minutes later. This is how I realized that my entire house currently smells strongly of weird cauliflower stench. Bet you wish you were here. See, I got excited when I saw that Bountiful Baskets was offering cases of cauliflower – 22 pounds for just $14.50. I snatched it up because I’m tired of paying over $3 for one small head. I figured it would be great to have this on hand to easily make Cheesy Cauliflower Hashbrowns. 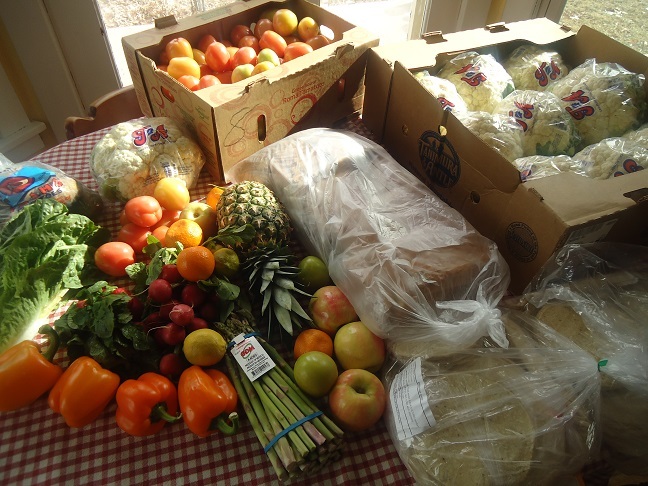 This morning, we picked up our basket along with a case of tomatoes (that are sadly very green), two packs of tortillas, a pack of bread, and yep – a case of beautiful, large heads of cauliflower! They were nearly twice the size of those I’ve seen at the store lately – and the cost of these broke down to just over $1.60 each. Great savings! I wasn’t particularly looking forward to prepping the cauliflower for the freezer – so I just decided to dive in and do it before I got busy with other work. 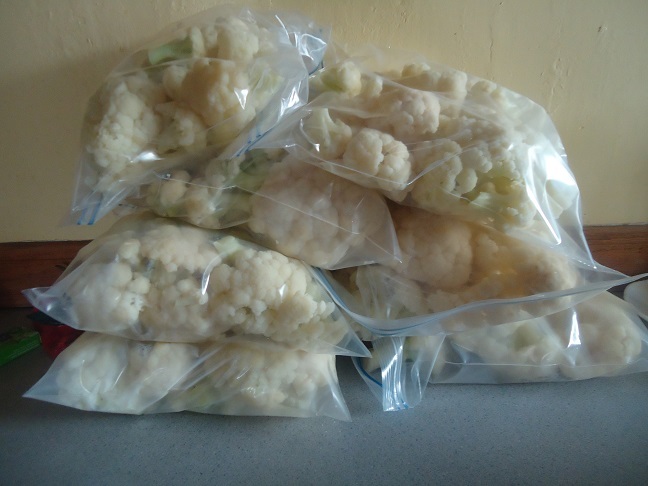 I soon had a nice system going to blanch all the cauliflower: wash, cut, blanch, rinse, repeat. The process is just like blanching and freezing broccoli, so head over there to read those instructions if you find yourself with plenty of cauliflower or broccoli. 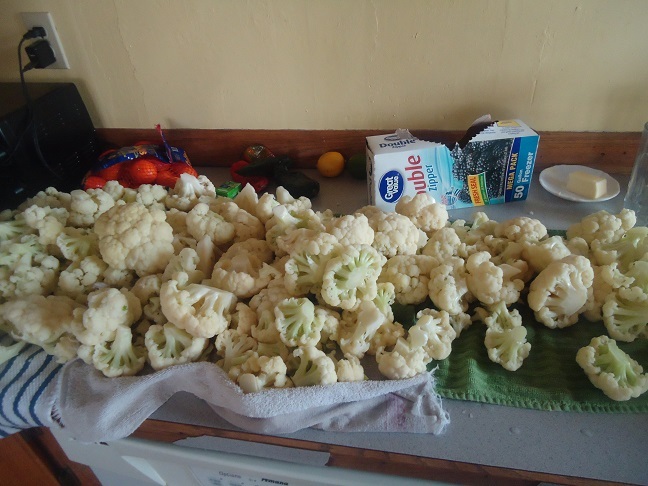 My long counter-top was soon covered with blanched cauliflower. I nibbled as I went, because why not? After it cooled, I bagged it up in freezer bags and stuffed it into a freezer. 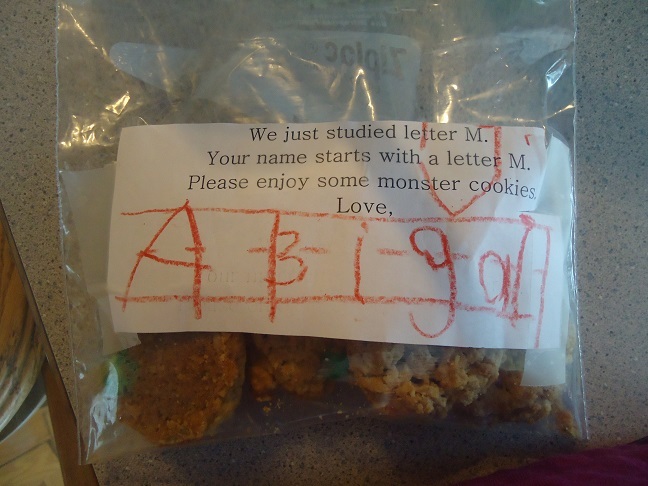 Then I left to drop off two of my kids at church to work on a project. I arrived back home, walked in, and almost gagged. There is a heavy hovering stench of cauliflower in my home. I guess this means I should probably bake something chocolate to knock that out. I mean, this smell cannot be what greets people when they come here. Now can I show you my favorite meal from last week? I baked a spaghetti squash, which I would eat any day over actual spaghetti noodles. (The boys still choose wheat noodles while Matt and I finish off an entire spaghetti squash by ourselves.) 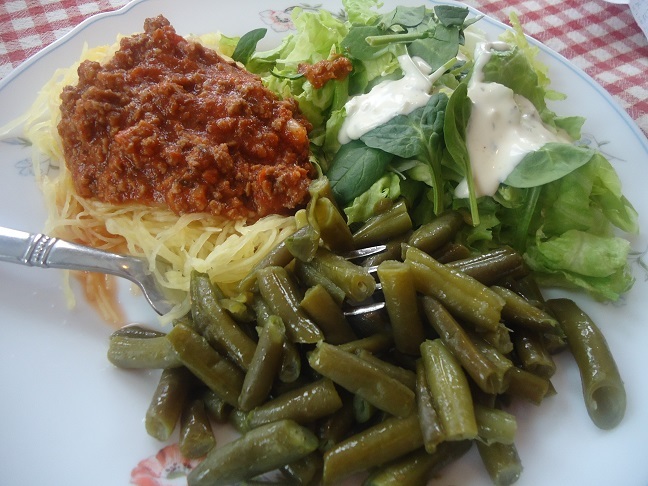 The squash with tasty meat sauce, green beans, and salad was so crazy delicious. I need to make this more often. A nasty sinus infection has now made its way through every member of our family (except for Asa who is living at a dorm and apparently not exposed to germs – ha!). 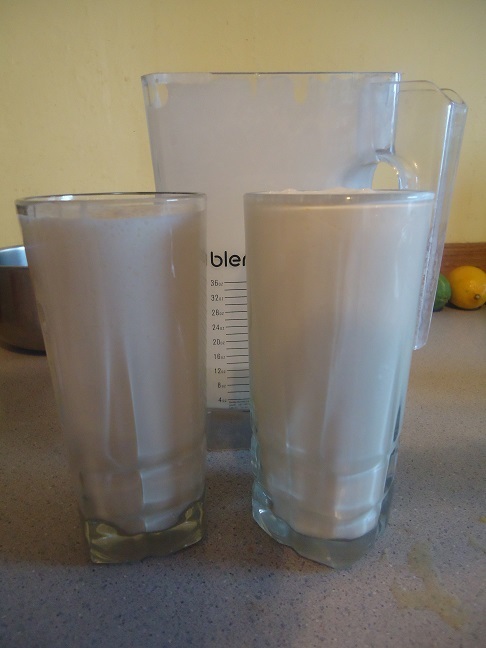 My homemade Orange Julius made with homemade buttermilk and freshly squeezed oranges has been so refreshing and filling. Dare I ask?? What does your house smell like right now?? So fun, I love scoring great deals on healthy stuff! Your meat sauce looks so tasty. I tried finding the recipe in your archives but didn’t have any luck with my search. Can you share the recipe? My house smells like applesauce, grilled chicken, and Chicken Quinoa Enchilada casserole …I have to admit that is much better than cauliflower :) I still love cauliflower though but I like to eat it raw. I, too, am sometimes horrified by the smell of my house when I come inside after cooking collards or cabbage or hard-boiled eggs. My husband’s boss said he is not allowed to bring leftover cabbage with his lunch any longer, since it makes the store smell when he heats it up! My house will smell like applesauce this week. We found organic apples on sale for $0.48 per lb. So we got 40lbs. It smells like fall! My house should smell like coffee. I can’t smell it right now because of a stuffed up nose, though. The other weekend I was at a debate tournament (I coach high school debate), and the hospitality room had a veggie tray. I stood there for probably 10 minutes eating all the cauliflower. So yummy. Especially when I don’t have to chop it. Don’t worry, I left other veggies for other people. I think my house smells “normal” (what is that?) right now, but I’ll probably have to leave and come back to know for sure. Yesterday it smelled like tacos, as I had made a taco casserole. When the house does smell funky, that’s when I like to put some citrus peels and herbs or spices in a pot of water on the stove to clean up the air and make things smell nicer. Or just light a beautiful-smelling candle. I love your honest-to-goodness posts. Thank-you. That is a great price on cauliflower! We cut all grains out of our diet (after reading Grain Brain and Wheat Belly Total Health) and have been eating lots of cauliflower, using it in recipes in place of rice or potatoes. We’re also eating lots of spaghetti squash in place of pasta. I am amazed at how much better I feel eating this way. Our house smells like blackeyed peas. Collards, cabbage, etc is the long distance food I have been told. Haha!! It does smell bad but it sure is delicious. Buffalo Cauliflower with Blue Cheese Dip is really trending right now as a healthier option to Buffalo Wings for the big game day. While we’re not huge into football, I think I’ll be making this! Hi! You might already know this, but if you put your tomatoes somewhere cool (like a basement or pantry without a heat vent), turn them upside down, and cover them with newspaper or tissue paper, they will slowly turn red. You should have fresh red tomatoes over the course of a few weeks. We have always done this with our green tomatoes in the fall before the first frost, and we can still be eating fresh tomatoes at Christmas time. Homemade gluten free bread (just out of the oven and tempting everyone while it must cool)! It also smells of fresh air as the kitchen windows are open because it is 60 something here in north Georgia today. I must get outside for a short walk and some sunshine. P.s. Love cauliflower too, but not the smell???? Was just reading your article and saw your creamy orange cooler recipe again. 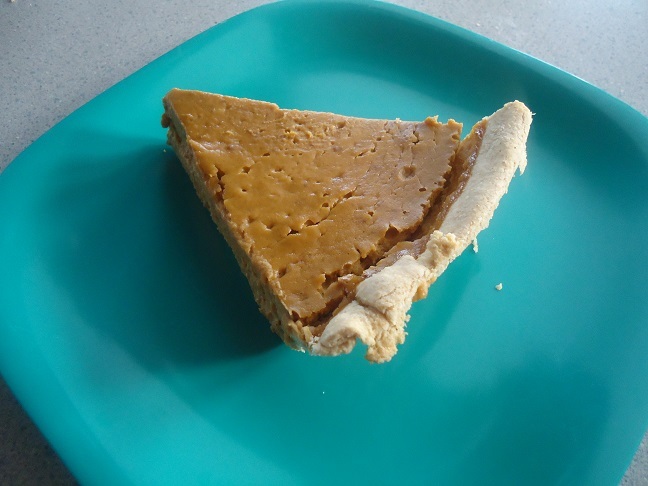 I made it over a year ago from your recipe and loved it! However, it just occurred to me to let you know, often dairy can cause more stuffy sinuses when you are sick! I have certainly found this to be the case for myself, so whenever I have a head cold I try to avoid butter, milk, cheese etc for a couple days. Handy to know for those pesky sniffles ???? Don’t worry Laura. One case of cauliflower is quite reasonable. ……THREE cases? maybe not so much. But yes, that is what I got, and why my house had “the smell” all last Saturday, and why my freezer now has “the smell,” and why I’m now stocked up with 68lbs. of cauliflower for the next year…. You can kill some of the smell of cauliflower if you are boiling or steaming it by placing a slice of bread over it while it cooks, then throw it away. why do you need to blanch them before freezing (or broccoli or green beans) ? I don’t understand as it only makes them a soggy mess when you go to cook them. I.e. we saute frozen green beans in garlic and coconut oil, we buy them at costco, they are whole and not blanched. Some friends gave us some home grown frozen beans that had been blanched and they were so different, and created a swimming pool in the pan I was trying to saute them in!